"Ever since I can remember," Barbra Streisand told a crowd at Lincoln Center Monday night, "people have been calling me bossy and opinionated." Of course, the crowd - which included the singer's friends, Bill and Hillary Rodham Clinton, was roaring at pretty much anything connected to her all evening, as the legend of song and screen was honored for her film career with the 40th annual Chaplin Award from the Film Society of Lincoln Center. And then there was "Yentl" - the first Hollywood movie to be directed, produced, written and starred in by a woman, as the crowd was reminded. Streisand spoke of how hard it was to get funding to make the film. Producers, it seemed, weren't as passionate as she was about the tale of a Jewish girl in Eastern Europe who so longed to study the Talmud that she disguised herself as a boy. It was only when Streisand agreed to turn the movie into a musical - and most importantly, sing in it herself -that she was able to go ahead with the project. Not that acting was so easy in the early going. At age 16, she recalled, she had to show in a scene that she was in love with a man. But she was not attracted to the actor, she said, so she placed a piece of chocolate cake nearby - so she could stare at that longingly, instead. 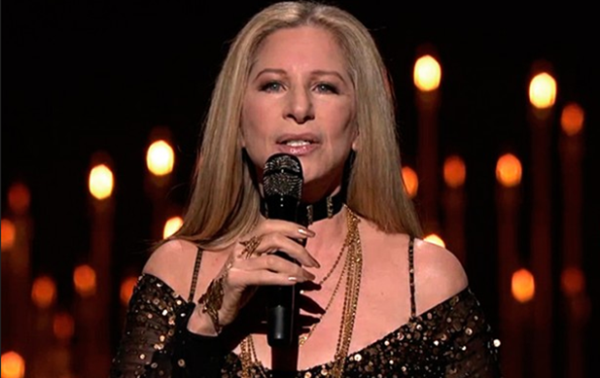 For the awards gala, which raised $2 million for the film society - twice the previous high amount for the annual event - Streisand was serenaded by Wynton Marsalis on trumpet, by Liza Minnelli, and by Tony Bennett, who closed the show with the song, "Smile," fittingly a Charlie Chaplin song. Also appearing onstage to praise their friend and colleague were Michael Douglas, Catherine Deneuve (last year's honoree), Amy Irving, Blythe Danner, George Segal, Ben Stiller, Pierce Brosnan and Kris Kristofferson. In video clips, Robert Redford - her "The Way We Were" co-star - spoke of how he'd been warned before making the movie that Streisand was "a pain," but discovered that she was "totally engaging to act with, beautiful, thorough and skilled." And Omar Sharif, who played Nick Arnstein in "Funny Girl," gave perhaps the most moving video tribute, talking about how incredible it was that he, an Egyptian actor, played a New York Jew in the 1968 film, and how she had become such a good friend. "We used to go to the cinema together," Sharif said. "We paid for our tickets and sat there and watched." It was Bill Clinton, though, who got the last word - before Streisand, that is - praising the singer as driven, in the best way. "Every great person is driven," the former president said. "But if that person has massive talent, big brains and a bigger heart, you want to go along for the ride."